lt_eurofighter and 1 Guest are viewing this topic. That's funny, yours working straight in main folder. I have DBW with latest Selector, only works in bin for me. I took the original Read Me and studied a bit, here's what I found. the DLL name is created). Repeat the process with another name from the list. for instance), so try to install ReShade to that one instead. and extract Reshade.fx, Sweet.fx and the SweetFX folder and put these in your bin folder too. Absolutely gorgeous lil Tool. Contrasts are richer and smacking now eyecandy. On our desert Maps it looks like FH2 Maps now, great. Say goodbye to yellow Maps. interesting to see how much it sharpens the ground textures in some shots. i have to test this for myself sometime, see if it changes this so drastically for me too, since i already have added higher anisotropic filtering and anti-aliasing with nvidia inspector. ...with my 4.10.1 & DBW 1.71. My videocard: Nvidia 660 GTX. No joy loading from bin utilizing TotalModder. There is likely some other locale required or config requirement to make this work with TM. If anyone finds solution, please post. If not, when I have some further time to investigate, I may find the solution. I have used it with TotalMODder without any troubles. There isn't anything TM3 could interfere with this. First, considering I have a Windows 7 64bit plenty of resources, I tried by renaming the 64 bit version to Opengl32.dll or specifying ReShade64.dll as the OpenGl Provider in Conf.ini, but it didn't worked, I had to specifically rename the ReShade32.dll to Opengl32.dll in the root of Il-2 1946 with the other amenities, and it worked OK.
No need to put it into the "bin" folder, really, not at all. When reshade absolutely refuses to work for you, check the folder where you put the file "Opengl32.dll" in (the renamed Reshade32.dll, usually your IL-2 game folder) and watch out for a file "opengl32.log"). If that file doesn't exist, reshade didn't load at all. If it exists, take a look inside. ERROR | Your graphics card does not seem to support OpenGL 4.3. Initialization failed.your graphics card just cannot handle Reshade. However, appears that il2fb.exe fails to load with an APPCRASH reported from Windows problems. 2015-06-30 11:27:59:364 : ** A total of 61588 files will MODify the Il-2 Sturmovik game when loading! 2015-06-30 11:27:59:364 : ** A total of 1 SFS files will be mounted when .preload is invoked! 2015-06-30 11:27:59:376 : Adding JVM Option: -Djava.class.path=. At this point, something appears to crash between completion of the initlog and the log.lst? Did you try updating your Selector to the latest version? I've just kicked out a new one today due to a bug caused by a faulty Vista June 2015 update. ... | INFO | > Installed 360 hook(s). ... | INFO | Redirecting ...So apparently your Reshade freaks out right when the game window should be created. You're right Mike, bin was useless no log created. OK, as I'm off on vacation I did a marathon to track up our issue. Appearently it's the same log as yesterday, with latest Version of Selector. That was not the culprit. Installation of 0.19 was only curious as it didn't showed what was wrong. demanding. No hope in sight. worser than here, no Log at all. Just crashing FH2 or PR 1.3 Selectors. Basicly it should work from my specs, as I have fella chaps in the BF2 community using it. I can run BF3 and never had probs. One fella talked about using earlier builds to test. 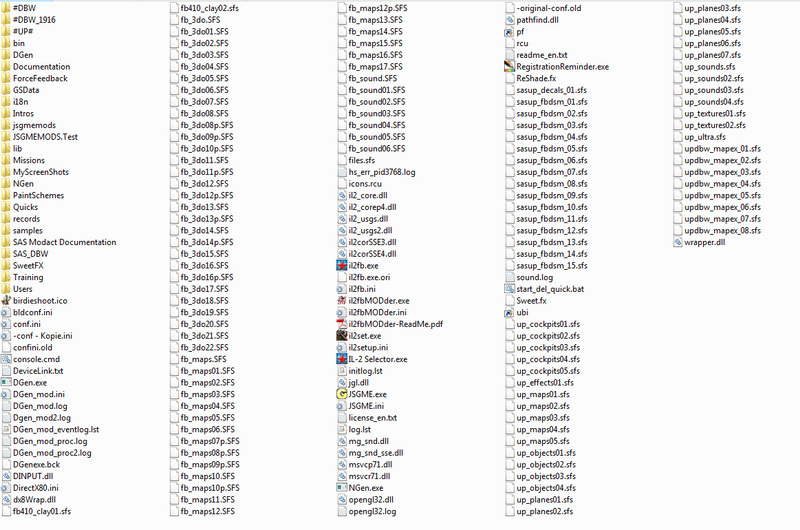 Did so, there I got prompted a plethora of missing dlls from my system... ??? and was prompted a Windows Error that my MSVCP110.dll is missing.?? Searched that file, manually inserted to my Vista, now I kept getting MSVCR110.dll is missing? it works, I got message popping at Startscreen, DBW loading. maybe it's another Microsoft Application needed, that I miss?! Reshade 0.18 seems to be living in the dependency hell. My dependency walker doesn't even survive opening that file and I cannot tell you what it is linked against and what not. For testing I'd recommend to set "USE_SPLITSCREEN 1" in SweetFX_settings.txt and "SweetFX_Greeting 1" in "Global_settings.txt" so you know whether it's working or not immediately at game start. Any anti aliasing mode was not working on my GTX 970. SMAA only makes all text ugly with spikes around it, but jagged lines on meshes and textures stay. FXAA has no effect at all. All other Reshade effects seem to be working fine for me. Enabled both Lines "USE_SPLITSCREEN 1" in SweetFX_settings.txt and "SweetFX_Greeting 1" in "Global_settings.txt"
01/07/2015 09:01:49:005  | INFO | > Delayed. 01/07/2015 09:01:49:006  | INFO | > Delayed. 01/07/2015 09:01:49:007  | INFO | > Delayed. 01/07/2015 09:01:49:007  | INFO | > Libraries loaded. 01/07/2015 09:01:49:047  | INFO | > Installed 5 hook(s). 01/07/2015 09:01:49:048  | INFO | > Libraries loaded. 01/07/2015 09:01:49:092  | INFO | > Installed 8 hook(s). 01/07/2015 09:01:49:092  | INFO | Initialized. 01/07/2015 04:11:12:903  | INFO | > Delayed. 01/07/2015 04:11:12:904  | INFO | > Delayed. 01/07/2015 04:11:12:905  | INFO | > Delayed. 01/07/2015 04:11:12:905  | INFO | > Libraries loaded. 01/07/2015 04:11:12:939  | INFO | > Installed 4 hook(s). 01/07/2015 04:11:12:939  | INFO | > Libraries loaded. 01/07/2015 04:11:12:982  | INFO | > Installed 8 hook(s). 01/07/2015 04:11:12:982  | INFO | Initialized. 01/07/2015 04:11:13:010  | INFO | > Installed 360 hook(s). 01/07/2015 04:11:13:399  | INFO | > Switched to new runtime 2F667338. 01/07/2015 04:11:15:867  | INFO | Recreated effect environment on runtime 2F667338. 01/07/2015 04:11:30:491  | INFO | > Successfully compiled effect. 01/07/2015 04:12:55:257  | INFO | Destroyed effect environment on runtime 2F667338. 01/07/2015 04:12:55:652  | INFO | Exited. How about switching to stock game mode using the selector first, just to rule out the obvious? If anything else fails and Reshade 0.18 works for you while 0.19 doesn't, then maybe you should stick with that old version until the Reshade devs found the reason why, and in order to assist them, you might want to report your troubles there. Who knows, maybe 0.19 isn't that compatible with the lower end of the supported graphics card list anymore?